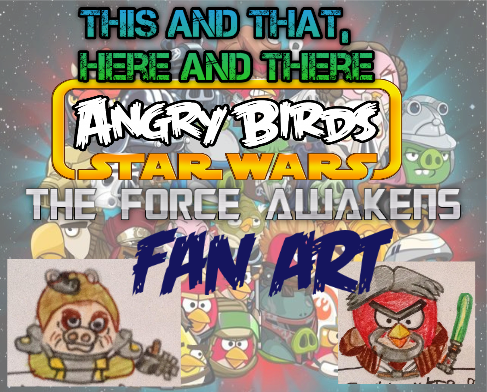 According to the last poll (which not many people voted on compared to the other polls), the two Angry Birds Star Wars: The Force Awakens fan arts that you wanted me to do are Unkar Plutt Pig and old Luke Skywalker Bird. So without further ado, here they are! 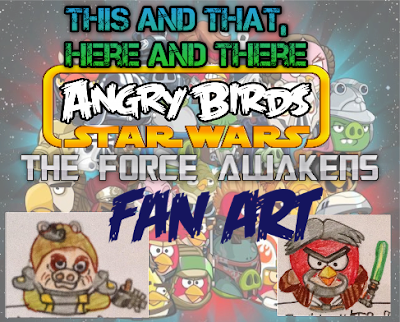 As you can see above, my drawing of Luke Skywalker Bird is very old and has grey hair and eyebrows. That is made to resemble what Luke looks like at the end of the movie The Force Awakens. He has the same iconic hair, although it is neater and less messy. He is the color red, of course. He has a grey moustache coming out of the sides of his beak, and a grey and white beard. He has a brown hood coming out of the side of his face. His robes are mostly brown, with a white layer underneath. He has a light brown belt with a grey metal part, His classic Jedi Knight lightsaber has a part brown and silver hilt, with a glowing green blade. As shown above, my Unkar Plutt Pig is shaped a lot like a blobfish. He has a brownish-green helmet/hat thing, with two piggy ears coming out. There is a metal part at the side of his hat. He kind of reminds me of the helmet pig from the original Angry Birds game.